Minnie Muse: What do you consider your best asset? Oliver Garavani: At this age, it has to be my love handles. MM: Do you have a favorite toy? 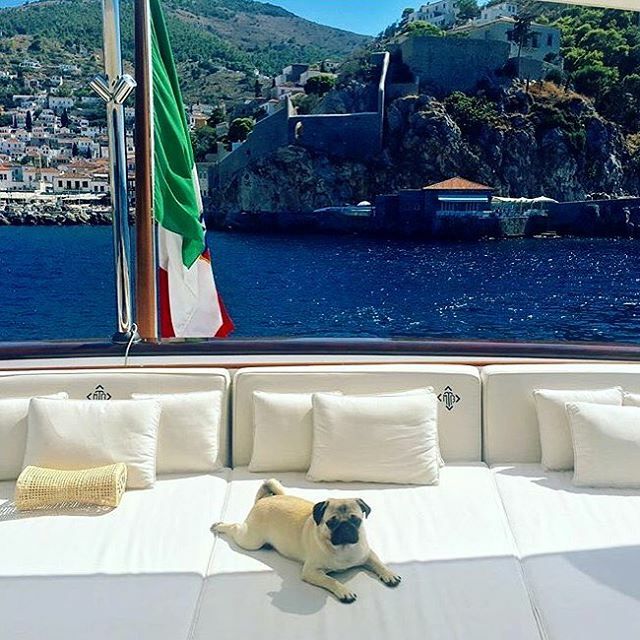 OG: I am too old for toys, but I have a special place in my heart for the limited edition stuffed pug wearing custom Valentino that my papa designed in 2012 for luxury fashion site Luisa Via Roma. It was part of their ‘Pug Dogs for Happy Kids’ charity auction, which supported UNICEF Project Arise and aimed to benefit children in the streets of Bangladesh. MM: What is your favorite movie? OG: I love the 1953 film ‘Roman Holiday’ because it reminds me of home. My favorite scene is when Princess Anne, played by Audrey Hepburn, eats gelato on the Spanish Steps at Piazza di Spagna – a historic area of Rome that is very dear to me. 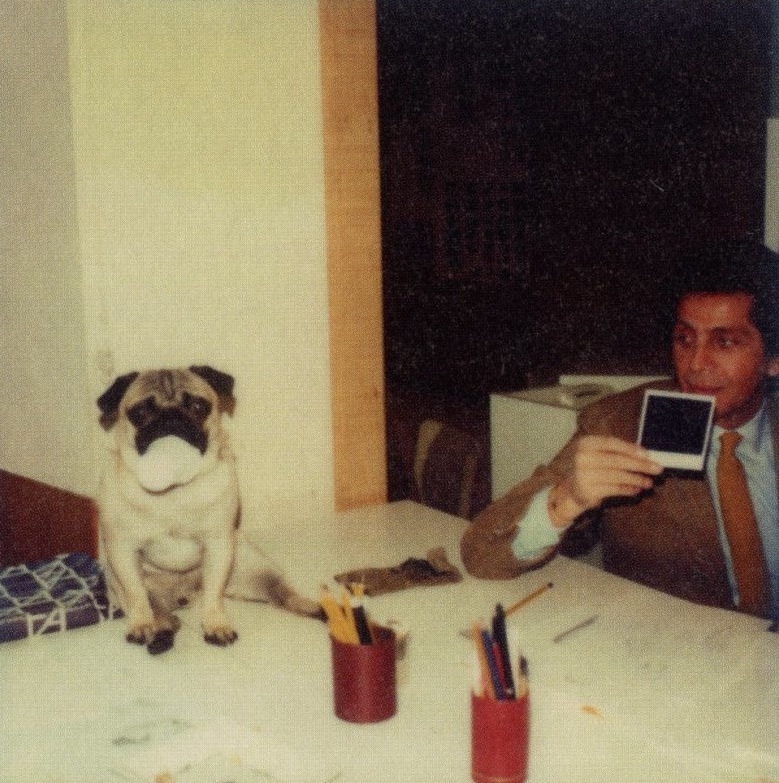 I remember going to the Valentino creative headquarters as a young pug with my papa, which are based in the 16th-century Palazzo Mignanelli near the steps. Just down the street on Piazza di Spagna is Valentino’s largest flagship in the world, which was designed by architect David Chipperfield and opened in 2015. 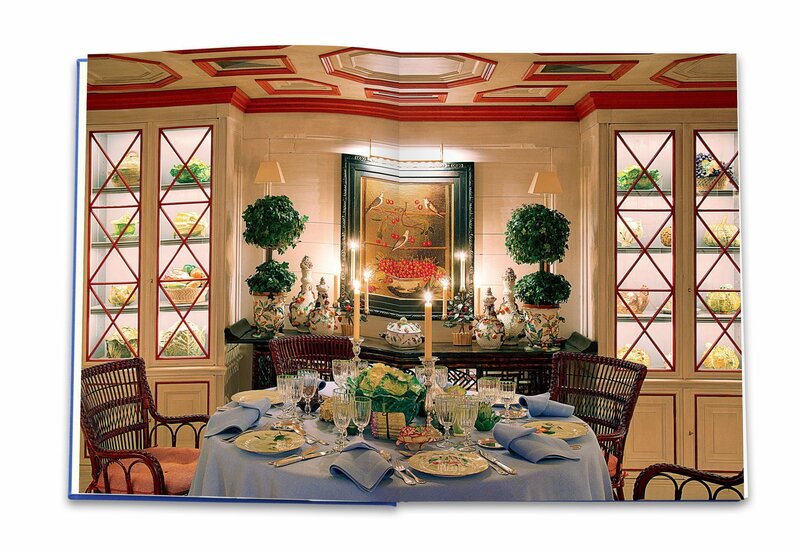 MM: Do you have a favorite restaurant in Rome? MM: Out of what type of bowl do you eat? MM: What is your preferred mode of Transportation? 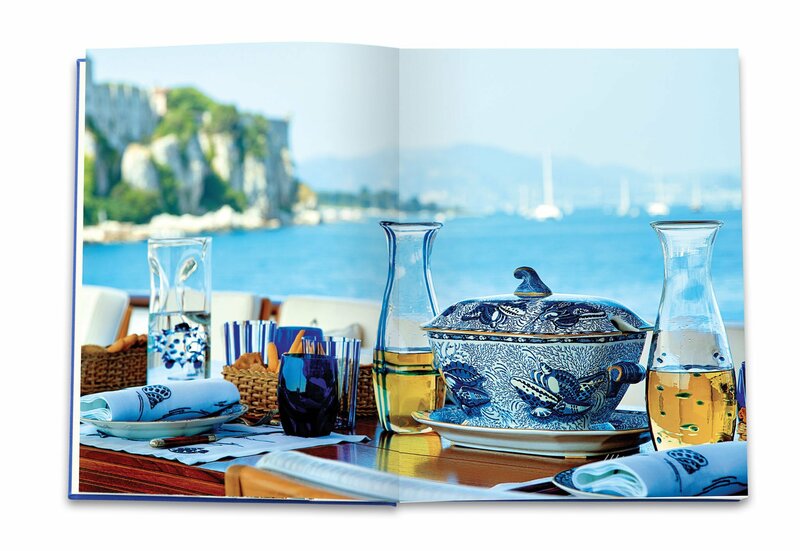 OG: Summertime yacht excursions in the Mediterranean are always my favorite. For as long as I can remember, papa and I have enjoyed many voyages at sea on the T.M. Blue One. MM: Do you have a favorite place to vacation? 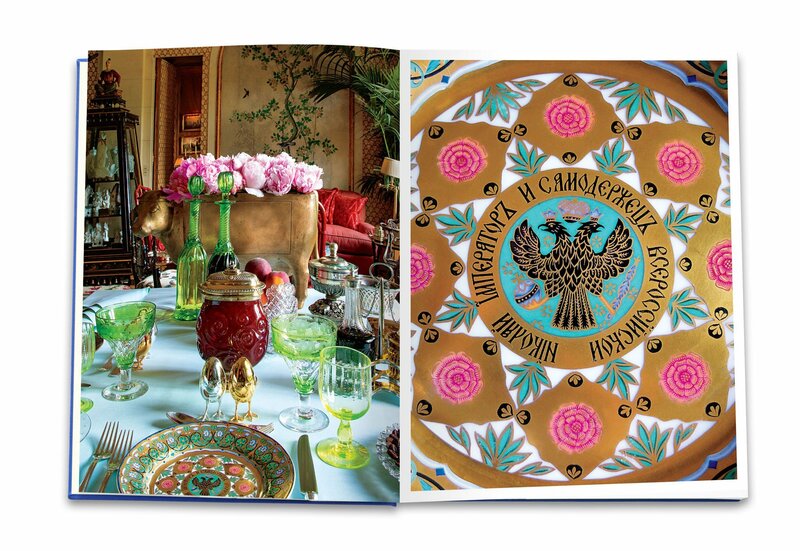 OG: I love springtime at Château de Wideville on the outskirts of Paris. 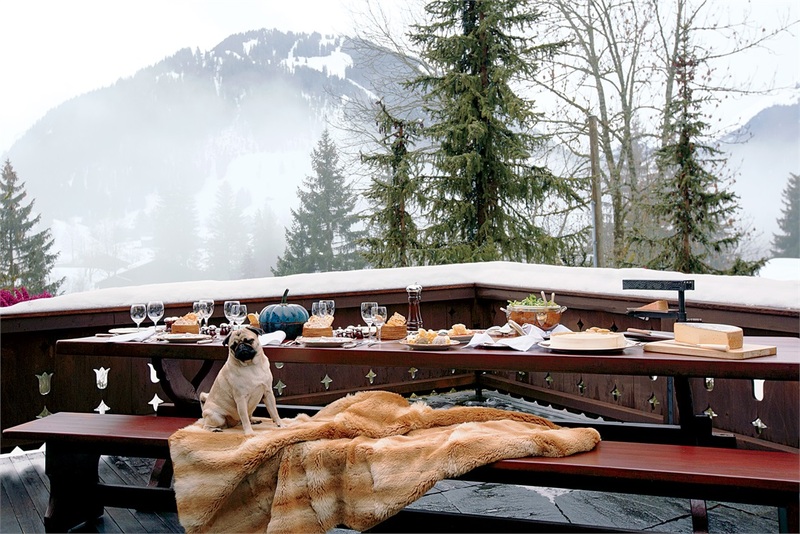 In the winter we go to Chalet Gifferhorn in Gstaad – Papa is the king of après-ski. MM: Your father has quite an incredible art collection; do you have a favorite work? OG: Andy Warhol did a series of bellissimi portraits of my papa in 1974. I remember Andy so well, he adored me and I became good friends with his dachshund named Archie. MM: What type of dog collar do you wear? 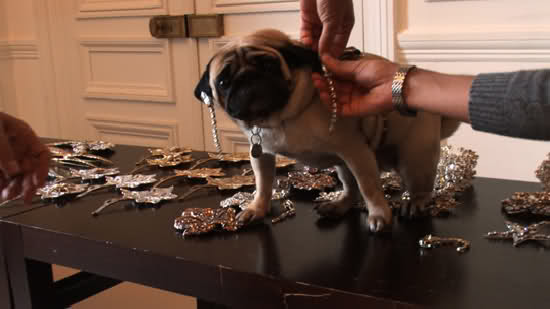 OG: I have had many siblings throughout my life, all pugs like myself. 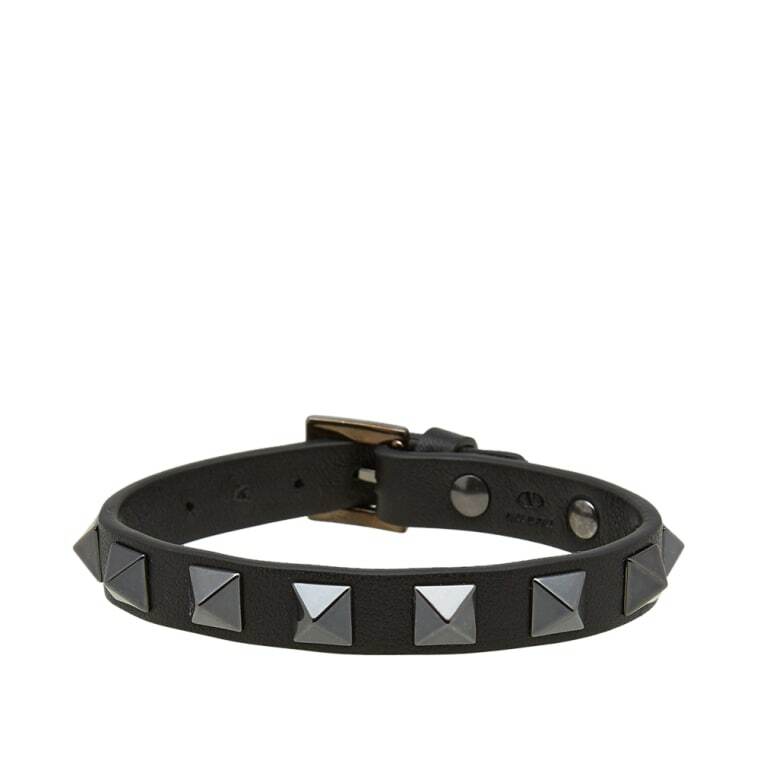 With all of us running around, papa gave us each different colored collars that mimic the design of his signature rockstud bracelet. As the eldest and patriarch of the family, I prefer a simple, classic black collar with matte black studs. MM: Being the dog of a famous designer, have you taken to accessories? OG: My papa always tried to dress me up in fittings during collection season. He would often joke around and get me to prance about the atelier in earrings, but I am past that stage in my life. 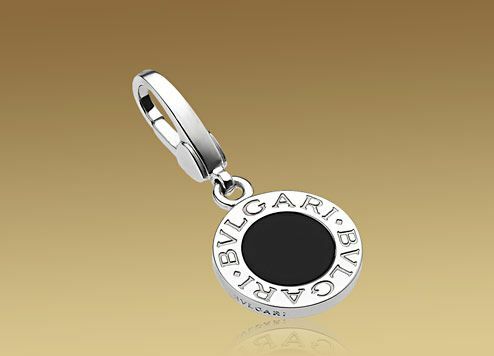 Today, I wear a simple 18kt white gold Bvlgari charm pendant with black onyx, engraved with my initials. MM: Do you wear perfume? OG: I have played around with fragrance my entire life. Valentino launched its first perfume for women in 1978, designed by the noses of the famous Givaudan house, and has since introduced dozens of alluring scents, all of which embody the glamour and elegance that has come to define the couture house. Lately, I have taken to Valentino’s Uomo Intense Eau De Parfum for Men, introduced in 2016. I love that the scent’s matte black, rockstud flacon matches my trademark collar – some may even say that I was the inspiration. MM: Do you have a favorite Color? OG: Valentino Red, of course. MM: Who is your favorite dog walker? 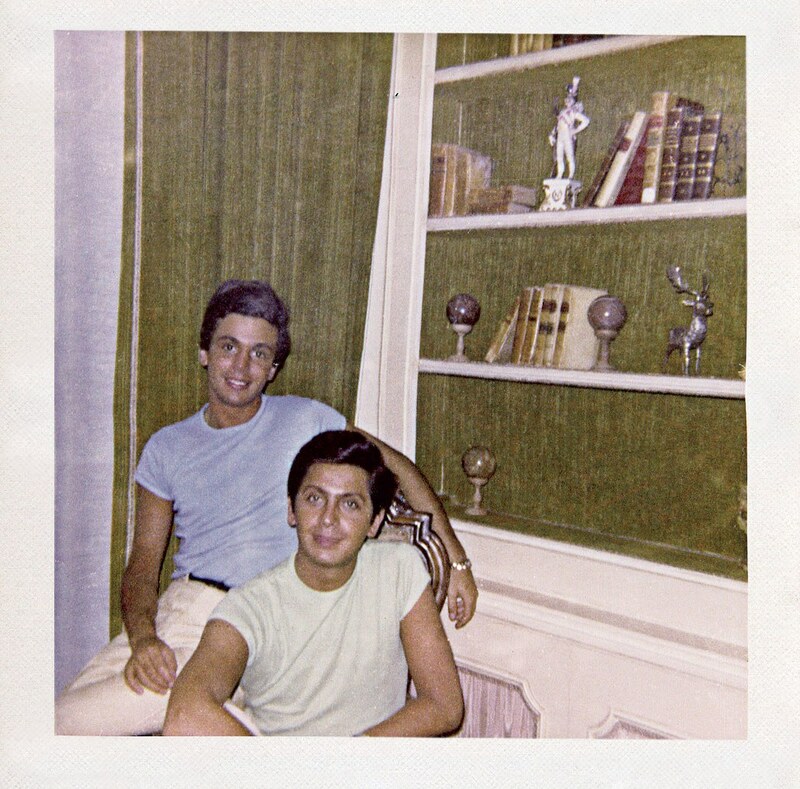 OG: My godfather, Giancarlo Giammetti. He worked with papa for over 50 years, and, as he would tell you, that work also included me. I rejoice in the memories of our long walks around Rome together; we often stopped for gelato in the afternoon during collection season before going back to the office. MM: Are you an avid reader? 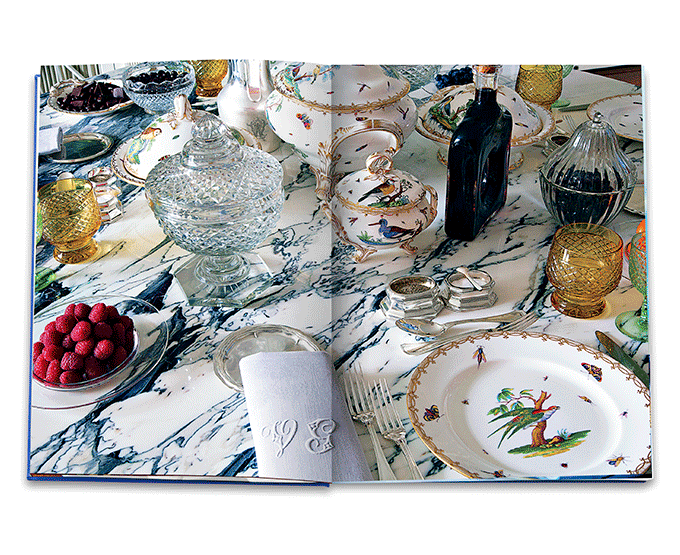 OG: I love flipping through Giancarlo’s coffee table book titled “Giancarlo Giammetti: Private,” published with Assouline in 2013. It is like a walk down memory lane. A very nostalgic snapshot of the past five decades, filled with stories and beautiful images of so many people I’ve met and loved throughout my life. MM: What do you consider your greatest accomplishment? 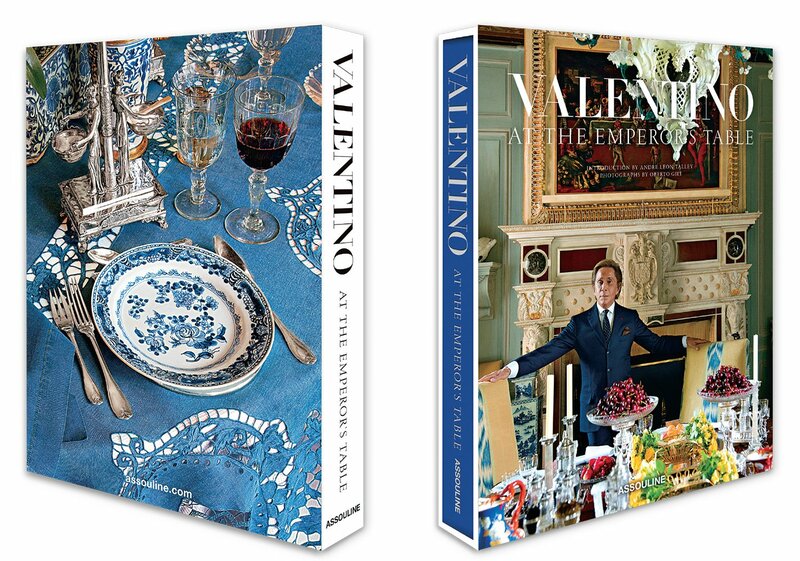 OG: I am quite proud of the Valentino ‘Oliver’ line that we launched in the 1980’s. While the collection wasn’t cut for dogs like myself, my papa was such a visionary, foreseeing the trend towards canine couture that took off decades later. I appeared on the garment’s tags and even made a cameo in the collection’s ad campaigns. 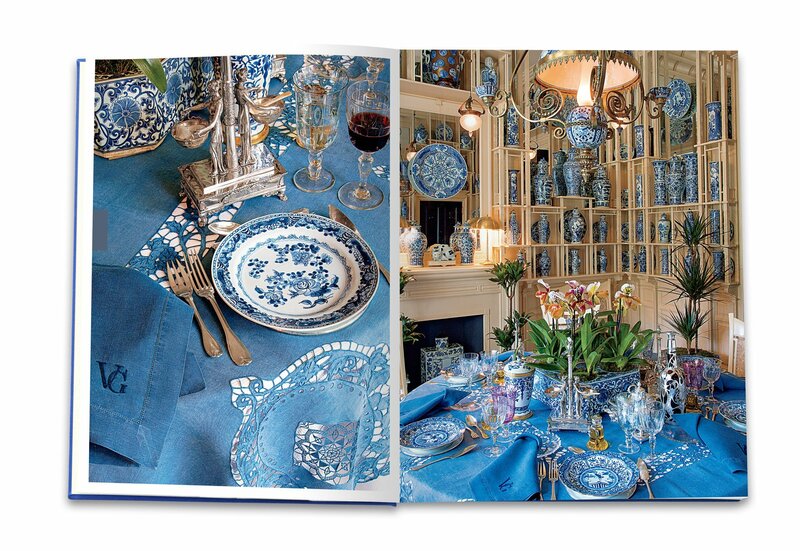 MM: Do you have a favorite look from the Oliver by Valentino Collection? OG: Naomi Campbell – La mia stella, amore mio (My Star, My Love)! – looked amazing in the Spring/Summer 1994 Oliver fashion show in Milan. The supermodel emerged on a swing wearing a black and white striped mermaid gown and a seashell encrusted bra and newsboy cap – a true 20th century Venus! 90s fashion was such fun. 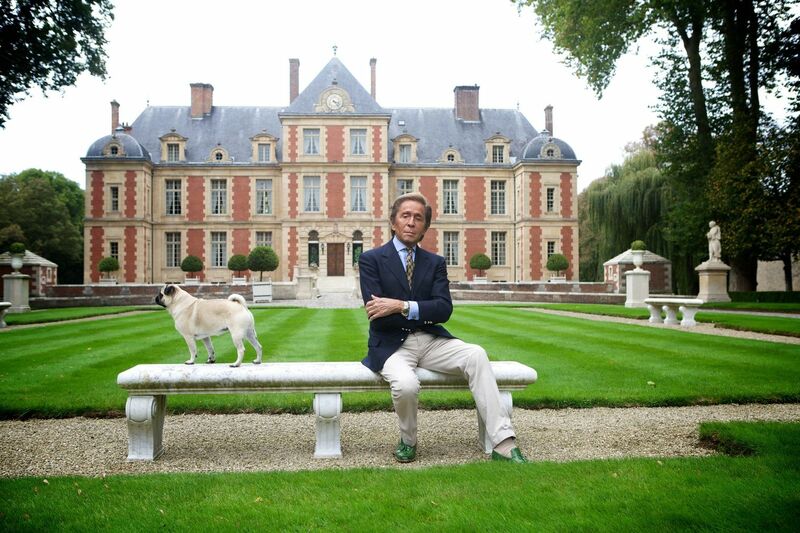 MM: Will Valentino ever release a clothing or accessories line for dogs? 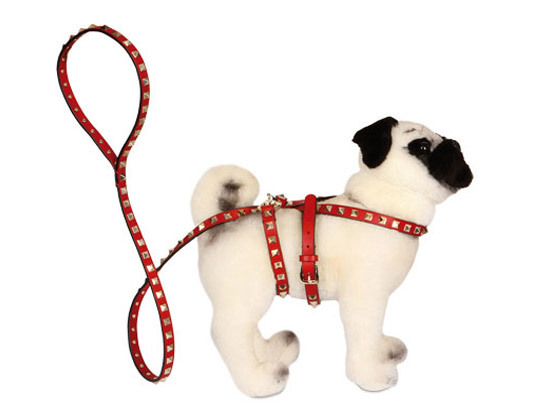 OG: It’s one thing to create a line on honor of your beloved pooch, but it’s another to create one FOR him. Papa once declared, “I find it demeaning and ridiculous. [My dogs] are not clowns or little dress up dolls and should not be treated as such.” The emperor has spoken - C’est fini!